ARS-funded research at the Human Nutrition Research Center on Aging at Tufts University shows potential health benefits of oat consumption beyond the prevention of coronary heart disease through lowering blood cholesterol. Health-conscious consumers long have chosen meals that include oats—in part due to a snappy “heart healthy” claim that prominently appears on the labels of packaged oat products sold nationwide. Significantly, ARS-funded scientists have not only discovered that certain compounds in oats hinder the ability of blood cells to stick to artery walls, but they have also found further indicators that the same compounds hold promise to provide other health benefits. This research is led by nutritionist Mohsen Meydani, director of the Vascular Biology Laboratory at the Jean Mayer USDA Human Nutrition Research Center on Aging at Tufts University (HNRCA) in Boston, Massachusetts. Meydani previously showed that phenolic antioxidants in oats actually obstruct the ability of blood cells to stick to artery walls. He showed that the compounds, called “avenanthramides,” from oats significantly suppress the adhesive molecules that glue blood cells to artery walls. Now, Meydani has been working on determining the anti-inflammatory and other effects of oat avenanthramides and their derivatives. He is using several animal models and colon cancer cell lines for testing purposes. As a result of using these models, Meydani has published several journal articles that shed light on the compounds’ potencies and molecular mechanisms. A 2006 study published in the journal Free Radical Biology & Medicine demonstrated for the first time that avenanthramide-c arrests smooth muscle cell (SMC) proliferation, which is known to participate in arterial lesion development. Unhealthy SMC growth contributes to the development of atherosclerosis, which can eventually lead to heart attack. Also, vascular endothelial cells, and to a lesser degree SMCs, are involved in the synthesis of heart-healthy nitric oxide. The researchers found that avenanthramide-c treatment of human SMC significantly and dose-dependently increased nitric oxide production in both SMC and endothelial cells. These results suggest that the avenanthramides of oats may contribute to the relaxation of arteries and the prevention of atherosclerosis by increasing nitric oxide production and inhibiting SMC proliferation. In fact, earlier human clinical studies conducted by Meydani’s colleagues at the HNRCA have shown that consumption of oats reduces blood pressure. Another 2008 study, also published in Free Radical Biology & Medicine, reported findings that suggest that avenanthramides decrease expression of inflammatory molecules. Because chronic inflammation of the arterial wall is part of the process that eventually causes disease, inhibition of inflammation through diet, drugs, or key nutrients is considered to be of great benefit in preventing atherosclerosis. 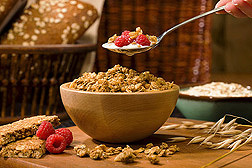 Findings from a more recent study soon to be published suggest that consuming oats and oat bran may reduce the risk of colon cancer, not only through high fiber content, but also through avenanthramides that slow or discourage proliferation of colon cancer cells. These studies provide additional indications of the potential health benefit of oat consumption in the prevention of coronary heart disease beyond its known effect through lowering blood cholesterol.—By Rosalie Marion Bliss, Agricultural Research Service Information Staff. Mohsen Meydani is with the USDA-ARS Vascular Biology Laboratory, Jean Mayer USDA Human Nutrition Research Center on Aging at Tufts University, 711 Washington St., Boston, MA 02111-1524; (617) 556-3126. "Oats: Cooling Inflammation and Unhealthy Cell Proliferation" was published in the February 2010 issue of Agricultural Research magazine.